Last Monday, September 13th I had the pleasure of speaking at the Nanotechnology Partnership Forum http://www.flcmidatlantic.org/pdf/OutlineNanotechnologyForumSept13.pdf in Gaithersburg, MD. We had the opportunity to tour the Center for Nanoscale Science and Technology www.cnst.nist.gov led by Deputy Director Lloyd J. Whitman. Thank you NIST team. The event will also address nanotechtology from a government perspective, including a National Nanotechnology Initiative (NNI) www.nano.gov update with Keynote Speaker, Clayton Teague, Director, NNCO on Monday, September 27th at 1:00 and a look at the current regulatory environment. NanoBusiness 2010 attendees will also have the opportunity to attend sessions at the co-located Water Innovations Alliance Conference http://www.waterinnovations.org/agenda.php, which runs an additional day, through Wednesday, September 29th. Last year our room block sold out so reserve your room today. Looking forward to seeing you in Chicago next week. This month’s interview, 6th in our series, is with Larry Bock, icon of the Nanotechnology Community. I had the pleasure of meeting Larry in Washington, DC in February 2002. We walked the Halls of Congress together and Larry was one of the key players in advocating for the National Nanotechnology Initiative http://www.nano.gov/. I asked Larry to be a Keynote Speaker for our 9th Annual NanoBusiness Alliance Conference http://www.nanobusiness2010.com/. However, due to Larry’s commitment to his USA Science & Engineering Festival http://www.usasciencefestival.org/ he had to decline. So instead, we bring you Larry. I hope you enjoy. In this month’s interview, we talk to Larry Bock, Executive Director, USA Science & Engineering Festival. Larry is a successful serial entrepreneur who has founded, co-founded or financed the early stage growth of 40 companies in the life and physical sciences from inception to achieving an aggregate market capitalization in excess of $30 Billion. Larry is a Special Limited Partner and currently serves as Chairman of Lux Ventures’ Advisory Board of industry experts advising the Investment Team. Larry was a co-founder and executive chairman of Nanosys, Inc. Prior to Nanosys, he was a managing general partner of CW Group, a life sciences venture capital fund. Larry was also a general partner of Avalon Ventures, a seed stage venture capital firm. Larry has been the founder and initial chief executive officer of Metra Biosystems, Inc., Neurocrine Biosciences, Inc. (NASDAQ: NBIX – neuroimmunology), Pharmacopeia, Inc. (NASDAQ: PCOP – combinatorial chemistry), Argonaut Technologies, Inc (NASDAQ: AGNT – combinatorial chemistry), and Caliper Technologies Corp (NASDAQ: CALP – lab-on-a-chip). Mr. Bock was also a co-founder of ARIAD Pharmaceuticals, Inc (NASDAQ: ARIA – intra cellular signal transduction), Athena Neurosciences (NASDAQ: ATHN, acquired by Elan Pharmaceuticals for $700M – molecular neurobiology) Inc., GenPharm International (acquired by MedaRx – transgenic animals), Vertex Pharmaceuticals, Inc. (NASDAQ: VRTX – rational drug design), Onyx Pharmaceuticals, Inc. (NASDAQ: ONXX – molecular oncology) and Illumina, Inc. (NASDAQ: ILMN – array based optical sensors). Larry is the inspiration and executive director of the Inaugural San Diego Science Festival which was the world’s largest science festival of its kind. Larry is responsible for recruiting major Collaborators and Sponsors and Public Policy initiatives. He and his wife have contributed $250,000 of their own money toward the effort. He earned his B.A. in Biochemistry from Bowdoin College and his MBA in Finance from UCLA. SW: It’s great to speak with you today, Larry. There are some exciting things going on around the country aimed at elevating the appreciation and role of science and engineering in our society. You’ve launched the USA Science and Engineering Festival (or SEF, for short). What was the inspiration that led you to create the SEF? LB: My inspiration actually came when I took my family abroad for two years and came in contact with international science festivals taking place there. I learned that science festivals have been quite popular and successful for some time in such places as Great Britain, Germany, Italy and parts of Asia. These events are similar in scope to major art, music and film festivals that we have in the U.S. What’s exciting is that the science festivals abroad are devoted specifically to celebrate all aspects of science and engineering through inspiring lectures, hands-on activities and exhibits and contests, in addition to integrating music, art, film, comedy and other mediums into science topics. The power and potential of these events to inspire students and others about science in fun, creative and exciting ways really impressed me, especially the festival I visited in Cambridge, England. I soon realized that we could really use events like these in America. For instance, in the last three start-ups I created in nanotechnology, we were not able to fill the majority of our scientific positions with Americans simply because not enough of them were going into these fields. SW: Having festivals to celebrate science and engineering in America is a wonderful idea. Your background as a successful entrepreneur specializing in advanced technology is ideal for what you are doing today. How much fun are you having with it? LB: No doubt, this venture is my love and passion because we are focusing on meeting a critical need in America: motivating and invigorating the next generation of young innovators about science and engineering, and at the same time, expanding the public’s appreciation and understanding of science and technology. We are working hard to make this the world’s largest celebration of science and engineering, so I’m finding that the Festival often demands more of my time than most of my start-ups ever did, but I’m enjoying it! SW: What is the role of science and engineering in fostering innovation and living standards? LB: There is a perfect storm of events at the present time which makes the role of reinvigorating the interest of Americans in science and engineering paramount. First, as I alluded to earlier, not enough Americans are going into these fields for various reasons, which seriously impacts how technologically innovative and competitive we will be tomorrow in the global market. In addition with H-1B visa issues, we are not retaining foreign nationals in science and engineering in the U.S. like we once did. Finally, many of these foreign professionals (although they may have received their training at our universities) are returning to their homeland to pursue better opportunities there. If this trend continues, we will have outsourced innovation. As I know from my own career, the U.S. had a lock on the biotech field for 30 years because the country was able to retain a lot of the leading scientists from overseas and able to cultivate available American scientific talent. As a result, various types of research-supporting jobs – for example, in manufacturing and operations – co-localized in and around these biotech locations, greatly contributing to the standard of living in these areas. But now, since we are having difficulty retaining foreign nationals and attracting Americans to new fields like nanotechnology, our once preeminent position as the leading research center is seriously threatened, and as a result, jeopardizing the economic impact that these jobs have traditionally had on the nation. SW: Many Americans can easily identify a prominent sports or music personality. However, it is fairly well known they cannot name a prominent scientist or engineer. And yet scientists and engineers are among the top income earners in the country. What gives? LB: Well, to quote Dean Kamen (the inventor and entrepreneur who founded the amazing organization called FIRST Robotics to inspire young people in science and technology): “Society gets what it celebrates.” If society puts more priority on celebrating the latest movie celebrities and rock stars – rather than, say, spotlighting the important achievements of scientists and engineers in meaningful ways – well, guess who our kids will look up to as heroes and role models? When asked to name a famous scientist, research shows that most Americans can at least name Einstein, but when asked to name a famous living scientist, most people are quite dumbfounded. They have never heard, for example, of a scientist like Craig Venter, the biologist and entrepreneur most famous for his role in being one of the first to sequence the human genome, in addition to his achievements as founder of such highly successful biotech start-ups as Celera Genomics and Synthetic Genomics. On the other hand, I also have to say that scientists and engineers must become more willing and accessible to telling their story to the public. These innovators are often great at communicating with their peers about their work, but not comfortable or adept at talking with the public about what they do. Learning how to communicate about the importance of their work (not only through understandable words, but also via direct and exciting hands-on demonstrations and other interaction) would do a great service in changing many people’s typical perception of scientists as boring, nerdy, unapproachable and made up almost exclusively of White males. SW: The idea of having festivals that celebrate science and engineering is cool. What are some of the novel and creative things you and your team have developed to stimulate interest in science and engineering across the country? LB: The Festival has implemented several key creative approaches which are proving quite effective. Here are two examples. The first is our Nifty Fifty Program in which we select leading scientists, engineers and high tech and life sciences entrepreneurs to go out to K-12 schools to talk about their work, the challenges and stumbling blocks they faced in their careers, how advances and principles in science and engineering can be applied to everyday life, and what students should be doing now if they are interested in entering such fields. Nifty Fifty presenters (which currently total more than 100) are selected based on their past success in speaking to and motivating young students, and for the creative and meaningful hands-on interaction and visuals they can include in their talks. Second, our Lunch With a Laureate sessions bring Nobel scientists to public venues to speak informally over brownbag lunches about their work, including the honor of having received a Nobel Prize in their field. Twenty-five Nobel Laureates are participating. Both the Nifty Fifty and Lunch With a Laureate approaches serve to demystify and humanize scientists and their work for students and the public – showing that many of these noted innovators came from the same childhood background as the average child, and faced the same challenges, fears and concerns that all of us face as we grow up and enter our chosen fields. In addition, we’ve instituted some effective approaches to how we are promoting the Festival’s Expo (the massive celebration that will culminate the Festival on October 23-24 on the National Mall in Washington, DC). For instance, we’ve come up with creative, timely themes for the wide array of interactive, hands-on Expo exhibits, stage shows and other presentations that will be taking place. These themes convey how science and technology play an integral part of everyday life – from music and art to sports and health – and show how cool these fields really are. Consequently, we think kids and others will be quite interested to check out such presentations as “The Physics of Skateboarding,” “Science Rappers,” “The Science of First Responders,” in addition to exhibits demonstrating how hip hop music and computer games are being used to teach math, and the integral role science played in uncovering great works of art. SW: You had your first Festival in San Diego, CA last year. Tell us how that went and what you learned from the event. LB: The Inaugural San Diego Science Festival in 2009 was a huge success, attracting 350 participating organizations, 500 programs and 250,000 participants. We learned much from this event, including better strategies for recruiting and organizing presenters and sponsors, in addition, ways to enhance the development of event content – all of which is providing us with important building blocks for this year’s inaugural National Festival. More specifically, one important area we have spent a lot of time improving is the way we go about recruiting and selecting our Nifty Fifty science and engineering speakers for schools. Last year, for the San Diego Festival, we recruited such speakers primarily based upon their credentials and reputation as leading researchers. But we later realized that some of them were not effective or comfortable speaking before or interacting with a roomful of K-12 students – preferring instead to deliver their routine version Powerpoint talks, which fell flat with the kids. Since the power and effectiveness of Nifty Fifty lies it its ability to connect on a very personal basis with young learners, we now select speakers based not only on their reputation as innovators, but also on their experience as outreach speakers. As such, we evaluate them on: their experience giving inspirational presentations to students and the lay public about their work and profession, including how their research impacts everyday life; how passionate they are about their topic; their ability to incorporate multi-media audio/visuals in their talks; skill in generating audience participation through hands-on demonstrations and other interaction, and their willingness to leave ample time for questions and answers following the presentation. A perfect example of one of our Nifty Fifty speakers this year who possesses these qualities is James Kakalios, a physics professor at the University of Minnesota, and who also serves as science consultant for Watchmen. His presentation, “The Physics of Superheroes” explains how he uses such superheroes as Spiderman, Superman and the Flash to teach others about the principles of physics, and how he has even influenced Hollywood in the depiction of these characters on the Big Screen. SW: The next Festival will be held in Washington DC, October 10-24, 2010. What was the rationale that went into choosing Washington DC? 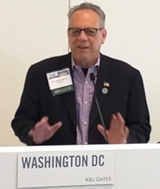 LB: Ray O. Johnson, the CTO of Lockheed Martin (one of our major sponsors for last year’s Festival, as well as for this year’s event) convinced me to take the Festival to the national level and to consider Washington, DC as the event’s staging point. The more I thought about it, the more I became convinced that DC and its surrounding metropolitan area was a natural choice. Not only is the Washington area the seat of government, it is also a vibrant center of science, being the home to numerous leading science agencies, organizations and societies. – 150 Professional Science & Engineering Societies including the National Academy of Engineering, National Academy of Sciences, AAAS, American Physical Society, American Chemical Society, IEEE, American Woman in Sciences, Society of Hispanic Engineers, and the National Society of Black Engineers. – 100 Universities/Colleges/Research Institutes including Harvard, MIT, Princeton, Georgetown. University of California San Diego, University of California, Berkeley, Johns Hopkins, U.S. Naval Academy, Duke, University of Maryland, J. Craig Venter Research Institute, and Carnegie Institute of Sciences. – 75 Government Agencies and Federal Laboratories including NIH, NSF, NASA, EPA, FDA, USDA, DARPA, Office of Naval Research, Department of Energy, Air Force Research Labs, Army Research Labs, Lawrence Berkeley Laboratory, Fermi Accelerator Facility, and Princeton Plasma Physics. – 50 High Technology and Life Science Companies including Lockheed Martin, Intel, JnJ, Motorola, Genentech, CISCO, Northrop Grumman, ResMed, Hitachi, and Bechtel. – 75 Informal Science Outreach Organization including the Smithsonian, American Museum of Natural History, US Botanic Gardens, and Koshland Museum. SW: We would assume U.S. policymakers are interested in what you are doing with your Festivals. What kind of feedback have you received from them? LB: Feedback from policymakers has also been quite positive, and bipartisan. The Festival has formed an Honorary Congressional Host Committee made up of more than 100 members of the House and Senate from both sides of the political aisle. Members include: Senator Dianne Feinstein of California; Senator Al Franken of Minnesota; Senator Harry Reid of Nevada; Senator Jim Webb of Virginia; Congressman Roscoe G. Bartlett of Maryland; Congressman Brian Bilbray of California; Congresswoman Judy Biggert of Illinois; Congressman Anh “Joseph” Cao of Louisiana; and Congresswoman Yvette D. Clarke of New York. You know, as much discord that there is in Washington these days, it’s really great to see that Congress can agree on one thing – reinvigorating kids’ interest in science and engineering! SW: Here, here! What kind of reception are you getting from the private sector? LB: This has also been good. We have over 100 leading high-tech and life sciences companies supporting the Festival. SW: Festivals are terrific because they cut across demographics. Are you finding that there is as much excitement from kids at the K-12 level as there is from their baby boomer parents? LB: It’s funny, when we hosted the Expo for our first Festival in San Diego at Balboa Park, I honestly did not know how many students and parents would show, so the night before the Expo, I called all my friends to ask them to be present the next morning at the event to stand in as visitors in front of the exhibits, just in case. But there was no need for that because by 11 a.m., 70,000 people had shown up, causing an 8-mile traffic backup on a major highway leading to the park. This demonstrated to me the huge, pent-up excitement for an event like this. I was also encouraged (and touched) by the number of parents, students, scientists and others who came up to me during and after the event to thank me for the incredible day and for inviting them. My own kids were also impressed. When they saw the long lines of people at the exhibits, they said for the first time they realized that what I was doing was fantastic, fun and interesting. SW: That is wonderful! Are you seeing growing interest in what you are doing with the Festivals from teachers and professors? LB: You bet. Whenever we announce a Festival event for schools, we get an overwhelming response from teachers asking how they and their students can participate. Teachers and administrators are really interested in how the private sector can bring these types of events to classrooms. It’s also important to point out that not only do students benefit from events like the Festival, teachers also benefit by learning about and seeing cutting edge research from leading scientists and engineers. This helps educators not only keep abreast of the fast-changing world of technology, but also in learning creative ways to implement such developments in the classroom. SW: I presume that the nanotechnology community is interested in what you are doing. What kind of participation are you seeing from the nanotech community today? LB: Yes, the nano community will be an important aspect of the Festival, and key nanotechnology institutions, organizations and societies have signed on as exhibitors for the Expo. For instance, Johns Hopkins University’s Institute for NanoBio Technology will demonstrate how materials and objects are assembled at the nano scale. Howard University will bring its Nano Express mobile science theme park exhibition; the Material Research Society will explain how the next historical age could well be called “The Nano Age,” and the Institute for Women’s Health Research at Northwestern University will show how nanotechnology is advancing the development of more effective medication. SW: How can people and companies get involved in the upcoming festival and future festivals? SW: Your new venture sounds exciting and promising. Are you still actively engaged in nanotech and other technology start-ups? LB: Yes, I’m currently a partner at Lux Capital, one of the leading bio-venture firms in nanotechnology. SW: One last question, Larry. You’ve been a successful serial entrepreneur and have a great deal of experience with start-up ventures. What advice do you have for entrepreneurs today who want to get involved in nanotech or other science and engineering-intensive enterprises? LB: My advice would be, despite the flagging economy, I think this is an ideal time to get involved in nanotechnology start ups. Looking back on when I entered the biotech start up field in the early 1990s (a period often called the nuclear winter of life sciences), companies that started then were often able to weather the storm during those tough economic times. This tested their mettle and gave them the preparation and inner strength to blossom and position themselves as leaders when the economy turned around. SW: Thanks again for your time today, Larry. We wish you all the best with the Festival this year in Washington DC and your other professional endeavors. You are currently browsing the Evolving Innovations weblog archives for September, 2010.